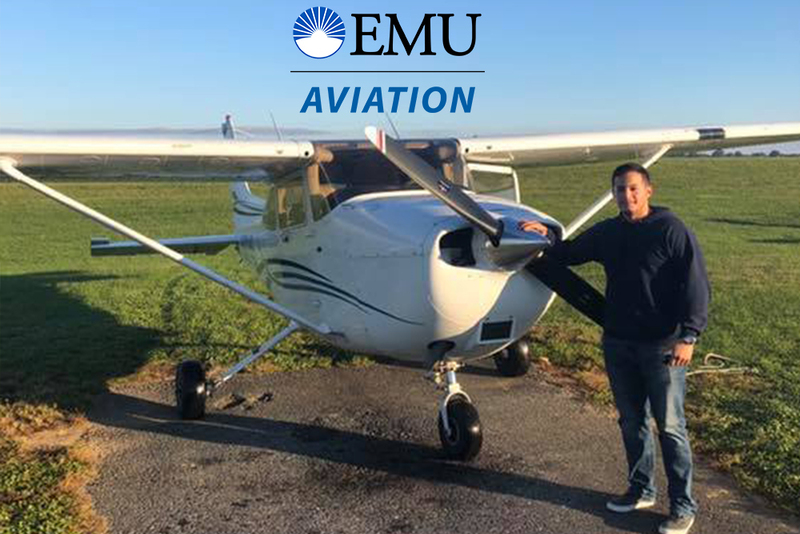 Christopher Leiva – a first-year student in Eastern Mennonite University’s new leadership and organizational management bachelor’s degree program with a concentration in aviation – has completed his first solo flight. Leiva, a former U.S. Marine, decided to become a pilot, he writes below, as a passenger in a flight over the Persian Gulf, so high he could cover countries with the span of his hand. Although his celebration of his first solo flight may have been subtle, it was an important accomplishment in his lifelong passion for travel freedom. A resident of Blandon, Pennsylvania, Leiva soloed on Oct. 25. His flight instructor is Mitchel Shenk. Why are you interested in aviation and when did you make the decision that this was in your future? Freedom of travel has always been of the utmost importance to me. It started when I got my driver’s license, then my motorcycle license, then my boating license. But the source of that freedom most rewarding to me is flying. The decision to make flying a part of my future, and actually being behind the controls, occurred when I took my first flight as a passenger in a V-22 Osprey. I was gazing out the rear of the aircraft as we flew around the Persian Gulf. As I stared I stretched the fingers of my hand and noticed that I covered several countries with my span. I remember thinking to myself, “The next time I do this, I’m going to be behind the controls.” It doesn’t have to be a military aircraft, but I would just like to experience that feeling again and again. I was fairly confident with my abilities to communicate with air traffic control, taxi the runway, take off, fly the pattern, and land safely. The winds were calm and the sky was clear so it literally was a smooth ride. I celebrated by reflecting on this accomplishment as I stared at a C-17 parked at the west ramp. I pondered the next steps in the program at EMU and Aero-Tech Services, and how far I’ve come and how much closer I am to accomplishing my goals. There are several reasons I chose EMU at Lancaster. The leadership and organizational management degree has real world application and relevance. The aviation concentration provided the opportunity to fly and to begin a career in aviation. Its schedule is convenient for adult students and is definitely worth the forty-five minute commute. I enjoy the interaction with peers in the program. There’s a comraderie between us because we’re all working toward similar goals. I enjoy the schedule because it allows ample time to attend to our other affairs such as work and family. But what I enjoy the most is actually being behind the controls during flight training. My professional goals are to fly for a state or government agency. I’m also interested in flying charter flights around the Caribbean and Central America.